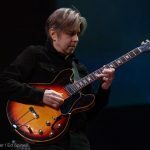 Eric Johnson’s Ah Via Musicom tour, featuring his original 1990 bandmates – drummer Tommy Taylor and bassist Kyle Brock, pulled in to The Arcada Theatre on Friday night for a rescheduled show from October 31. Anticipation from ticket holders was high, to say the least. 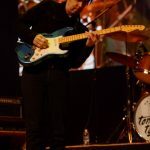 This tour, very well received since the first leg commenced in 2017, proved that the current iteration is no exception. Listening to the comments in the audience pre-show, Johnson’s reputation of being a class act was undoubtedly apparent. There is a charm about the Arcada Theatre that seemed to be a good fit for the show I was about to see. The theater’s ubiquitous impresario, Ron Onesti, prepared a video projected on the Arcada’s massive video wall that welcomed the nearly sold-out crowd, which he does each time he cannot personally attend and M/C a show. As Johnson and company took to the stage, the resulting reaction from the audience was deafening. 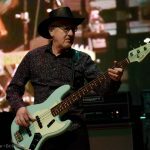 The band opened with “Stratagem” from the newest album Collage, which could easily stand right along with the other EJ staples in his catalog, especially by early-nineties Musicom standards. As a guitarist myself, I was immediately struck by Johnson’s anti-guitar-hero persona. 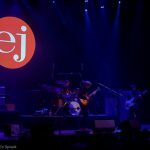 Although I have been an EJ admirer for decades, this was actually my first time seeing him live, and that perspective should temper this review. 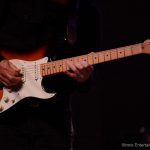 I mean, today’s newest crop of gunslingers – which include guitarists like Guthrie Govan – owe a debt to the wunderkind from Austin. 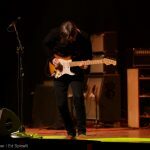 Although I have seen Eric Johnson in countless videos, experiencing this guitar star live takes on an entirely different vibe. It was so refreshing to see him in such concentration with his instrument and his craft, with little to no attention given to being an over-the-top/flashy performer. His humility in performance comes through as entirely genuine. 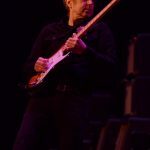 Absent is any hint of ‘entitlement’ that so many rock star guitarists seem to translate, intentionally or unintentionally, to the audience. 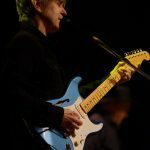 Most of the faithful worshippers in the house seemed to be long-seasoned veterans of the Eric Johnson experience. A quick query of a few audience members to my left and right revealed long-standing fans juxtaposed with a couple who had only seen EJ once before. Nevertheless, both factions seemed to enjoy what was coming from the stage thoroughly. 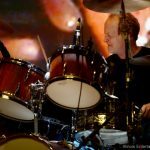 EJ’s dexterity is legendary; his chops blend rock, jazz, and classical so seamlessly it’s as if he has singlehandedly invented a new genre altogether. 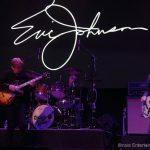 In this day and age of the omnipresent guitar player, it’s even more critical for guitarists to be able to stand out from the rest with their own voice, and Eric Johnson has been doing just that all these many years. This concert was conceived, says Johnson, “from really listening to the feedback that my fans provide. 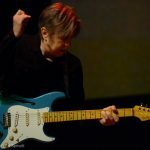 They have been after me for the longest time to perform my Grammy-winning Ah Via Musicom album in its entirety live, and in 2017, we decided that now is the time.” So the show was conceived in two parts, the first set being fan favorite non-Musicom gems, with the second set being the Ah Via Musicom album performed in its entirety. 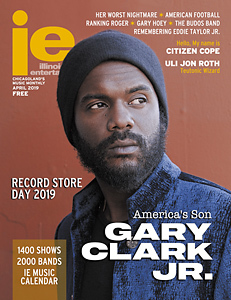 During the show, Johnson spent a fair amount of time speaking to the audience with behind-the-scenes stories and anecdotes explaining what certain EJ songs meant to him. 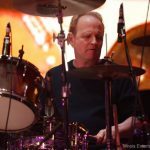 When the band played the opening notes of the beloved tune “Manhattan,” you could hear an audible gasp of approval from the audience. 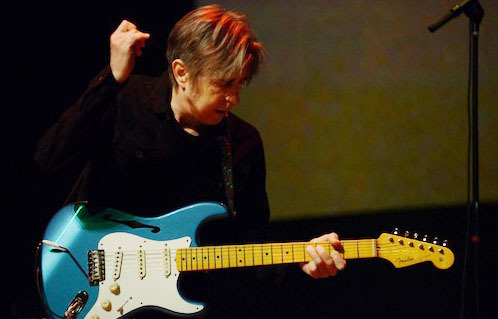 Such incredible taste and class from the mind and fingers of the six-string maestro. 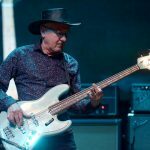 With the tune being a nod to Wes Montgomery, where octaves meet pure EJ groove genius, all in attendance were collectively breathless. Johnson, unlike his compadres in the proverbial guitar-dom, sings about 50% of his material – and he can actually sing. 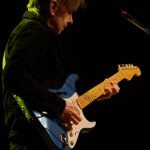 It is a welcome distinction over the other guitarists who either stick to the instrumental model or employ a separate singer. EJ was also very aware of his talented bandmates and introduced them several times during key moments throughout the evening. 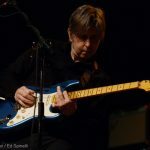 By the time the band launched into the first cover song “The Land of 1,000 Dances,” the Chris Kenner-penned early 60’s rock anthem with its “Nah, Nah Nah Nah Nah” chorus, Eric Johnson fans were ecstatic with the show and continued to be as it approached the end of the first set. One intermission later, the massive video wall projected the Ah Via Musicom logo, and we were off to Musicom-land. 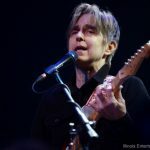 The title track of the album proceeded with its moody soundscapes and special effects, but it was when the familiar strains of the intro to “Cliffs of Dover” began that the place went up for grabs. Interestingly, this most famous of EJ tunes provided the only case of slightly out-of-sync playing that I noticed all evening. 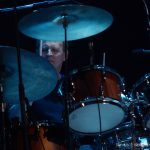 When Eric hit the hook of the song (in what would be the ‘chorus’ if the tune had a singer), it was the only time in the evening that the band as a whole were just slightly rhythmically out of sync. Call it a sudden bout of ‘acute rhythmitis’ or possibly a monitor issue? Or maybe just not being able to hear as well as they needed to on stage at that moment. Any non-musicians would likely not have even noticed. Still, they recovered nicely and the rest of the tune, as well as the rest of the album, was played flawlessly. The requisite encore was unique. 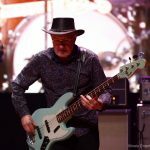 Instead of just doing a single tune the band did a few, left the stage and came back to do several more, leaving both the band and the audience both thrilled and physically spent. 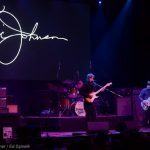 Throughout the evening Eric Johnson was the consummate professional, never wavering from his devotion to pleasing himself, his bandmates, and the audience with his artistry, his ability, and his music. He is indeed a class act. 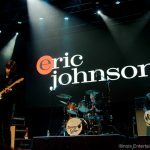 Great review of the Eric Johnson Show at the Arcada Theater In St. Charles.